Dual-burn design for more thorough burning and cleaner exhaust. Measures 23-1/4" x 23-3/4" x 21-1/2". Get Regency Fireplace Products contact information plus see product stories we've published about the company. A wood stove insert can transform an energy sucking masonry fireplace into a modern, high efficiency appliance. 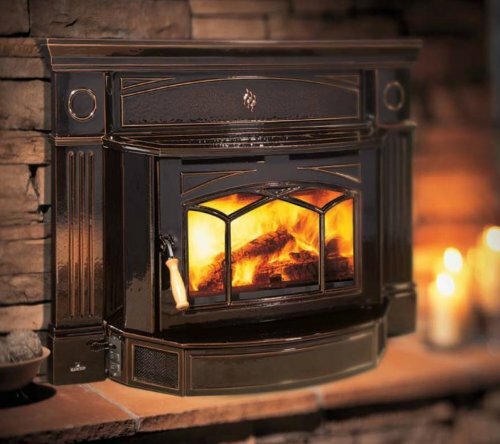 Regency's cast iron Hampton model produces up to 75,000 BTUs, enough to heat about 2,000 square feet. Fill the brick lined firebox with 18" logs and the fire will last eight hours without needing to be restoked. This maintenance-friendly, non-catalytic wood stove achieves an optimum efficiency rating of 77%. It's designed to slip right into most older masonry fireplaces. The porcelain encamel finish and is offered in brown or metallic black.